Netflix is bringing us a binge watch of childhood memories with the debut of Lemony Snicket's A Series of Unfortunate Events. Food is a big part of the stories and in the beginning, The Bad Beginning, the Baudelaire children don't know how to cook, in fact sometimes they even burn toast. What a suprise one morning when the Baudelaire orphans found that Count Olaf had sprinkled their morning meal with the beautiful fresh red berries they loved when their parents were alive. The kind gesture coming from him was quite suspect. And if those last few sentences are lost on you, you better queue up the Netflix. But in the spirit of the upcoming series here's an impressive oatmeal recipe you can use at home. And because you leave it overnight there's no suspicious cooking required. 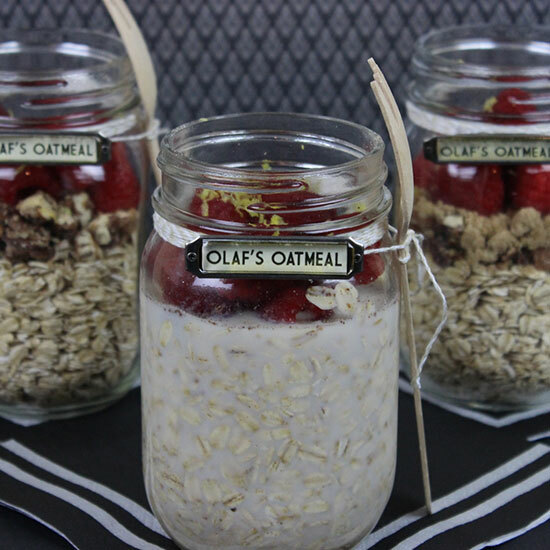 In a mason jar add the rolled oats, milk, chopped pecans, brown sugar, vanilla, cinnamon, nutmeg and salt. Stir together, then top with raspberries and lemon zest. Cover and refrigerate the jar overnight. In the morning stir together to eat, or heat in the microwave to serve warm.